This article is designed to give you information to make an informed decision regarding an expensive option on your vessel. There are many materials available and in use in the enclosure industry and each have its own pros and cons. The Fraternity Members and I feel that if the enclosure best suited for your current application is not cool2sea™, being honest now is the best policy. Members offer a wide variety of products and are committed to providing the best and most appropriate products for each application and owner. 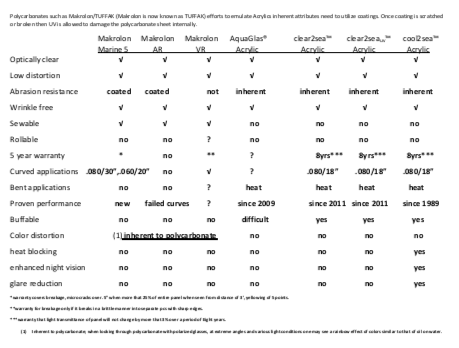 Click here to see a large comparison graph between Acrylic and Polycarbonate or click on the chart below to see larger version of this chart. This information is an attempt to untangle the confusing, confounding and often costly mystery of the various clear products used in the making of enclosures for the boating world. Many would prefer that this all stay a mystery. However we are dedicated to serving the boating public with honesty and integrity. It is our belief that giving the consumer information so they can make an informed choice is the ethical and proper path for all companies. Not every boat or owner is a candidate for any particular enclosure. Making the right choice is in everyone's best interest! To achieve this education you need information! We hope this information will help you make the right decision for you. What Are the Different Products? It may at first seem a simple task to explain the different materials. However, the different materials go by many different trade names and are not always clearly identified. We hope the following will help make you aware of what the products are and your options as you go foward with your purchase. Acrylic is made from transparent thermoplastic resins formed by polymerizing esters of acrylic acid or methacrylic acid. Acrylic is the clearest of the products used for enclosures. It is, in fact, clearer than normal real glass. Acrylic cannot be sewn through, no matter what thickness! Therefore, conventional means of constructing an enclosure cannot be used. There are also MODIFIED ACRYLICS: These are acrylics with an additive that impart special properties making them more break resistant. These properties also make them slightly more susceptible to scratching and having more haze than the conventional acrylic. Modified acrylics include: IMPLEX®, DURAPLEX®, AquaGlass™, and others. CYRO®/EVONIK(R), a leading manufacturer of Acrylic produces a modified acrylic that seems to have overcome deficiencies of the past modified products and making it ten times more break resistant. It was for this reason that the Fraternity utilized CYRO®/EVONIK(R) to exclusively manufacture its next generation of enclosure acrylics, marketed as cool2sea™, clear2seaUV™ and clear2sea™ (from the inventor of EZ2CY®). Coated Acrylics are also available: these acrylics have a coating that makes them more scratch resistant. However, scratches that do occur cannot be buffed out of coated products and they are not meant for curved or flexing applications. One of the most widely known coated acrylics is LUCITE®SAR. ACRYLICS are inherently resistant to UV (ACRYLITE® has a manufacturers warranty stating it will not change by more than 3% light transmittance or 3 on the yellow index in ten years). Coatings are not necessary for this attribute. Acrylics are also resistant to many chemicals that are readily found around boats such as diesel oils (smoke film) and turpentine. This however is not an indication that the acrylic protects you from UV. Acrylics block approximately 70% of UV leaving most of UVA radiation to do harm on boaters (read UV and Enclosures) clear2seauv™ and cool2sea™ block 98% of UV and have patent pending on the sheet form suitable for the marine enclosure market utilizing this UV blocking technology. cool2sea™ acrylic has inherent technology blocking 23% of infra-red heat (in addition to 98% UV) and has patent pending on the sheet form suitable for the marine enclosure market utilizing this heat blocking technology. In real terms, cool2sea™ can keep boaters almost 10 degrees cooler than other enclosures. A distinguishing trait of this acrylic is its green hue. A notable downfall of acrylic would be its break ability. When bent beyond its limit (typically during opening or closing) it can break. However a Tensile Strength (that which is exhibited during use in the closed position) of 10,000 lbs. is greater than any of the other materials discussed herein, excluding vinyls, which will stretch. In the application of a boat enclosure this downfall is easily avoided by learning proper handling procedures. In addition, the modified acrylic utilized in cool2sea™ and clear2seauv™ has minimized this issue. Polycarbonates are a class of resins that are thermoplastic, tough, transparent, and nontoxic. Polycarbonate is not as clear as acrylics and exhibits a rainbow effect of colors when viewed from various angles. This effect is amplified by polarized sunglasses and is particularly troublesome when trying to spot feeding billfish. Most of us were introduced to Polycarbonate by Sheffield Plastics whom produce HYZOD®/Makrolon® and introduced it as "Polycarbonate for the Marine Industry" that could easily be sewn. Interestingly enough, one of the disadvantages listed was "water spots difficult to remove." Polycarbonates are tough, they tend to dent rather than break when struck with a hard object, in thicknesses more than .080 the object is even more likely to just bounce off without denting. Contrary to what some believe however, polycarbonate is softer than acrylic. This inherent trait while improving its resilience, nonetheless, makes it more susceptible to scratches and is a detriment to the ability to compound them out. Coated polycarbonates (MAKROLON AR) overcome this aspect but are not meant for flexing applications or curves. They are meant for flat glazing applications. When curved the coating is stressed on the outside curve and compressed on the inside creating coating fractures that appear as vertical crazing. Polycarbonates are subject to UV to a much greater degree than acrylic and do not have as much tensile strength. Un-coated can change as much as 7% light transmittance in 60 months of South Miami sun (TM 90-12 GE data). Percent of haze in those same months went to 55.7 and yellowness index went to 13.5. Polycarbonates are attacked by diesel oil/smoke and turpentine. Thin forms .020, .030 can easily be sewn. Thicker, such as .060 can be sewn, but not practically. Brand Names of Polycarbonate Include but are not Limited to the Following: MAKROLON®, MAKROLON AR®, LEXAN®, Cyrolon®, HYZOD®, Crystal-Flex® and Aqua-Lite®. One should be careful because like acrylic, Polycarbonates are notch sensitive. This means that if a notch is made on the edge of the thin sheet it can readily be torn, much like paper. When sewn a spiral notebook affect can also be troublesome and should be a real concern. The thin gauges of polycarbonate are available with UV inhibitors but lack quality that would make them resist the effects of UV experienced on boats. They are however practical on dodgers of sailboats that have relatively small area and can readily be covered when not being used. On large applications the thin polycarbonate tends to rattle like a tin sheet. While it can be rolled to some degree, this is not practical because of the severe scratching that will ensue. Rolling or opening improperly can result in a dimple that is permanent. The thicker Polycarbonates are not practical to sew therefore conventional means of constructing an enclosure are not generally used. The big advantage over the thinner products is inhibitors that help resists the effects of U.V. HYZOD®SL is an example of polycarbonate with U.V. protection. It starts life with an 86% light transmittance and is warranted not to change by more than 5% in five years. It is also warranted not to increase in the Yellowing index by more than 5 in the same period. HYZOD®AR and MAKROLON AR are examples of a UV inhibited polycarbonates with a coating to protect and provide scratch resistance. This product is however only for flat glazing and should not be exposed to the flexing and stresses associated with boat enclosures that would cause delaminating of the protective coating. It is also important to note that once coatings are scratched they cannot be repaired. Both of these products have manufacturers warranties against breakage but are limited to flat architectural glazing that would preclude coverage in the boat enclosure environment (for more information, visit the Sheffield Plastics Inc. website). Almost everyone in the industry knows about Clear Vinyl but very few know a lot about it. It is very difficult to find data and information on it. Because this information is targeted at the higher end products, we will discuss .040 pressed polished and will omit information on .020 and .030 rolled goods. Clear Vinyl: a.k.a. ISINGLASS® is clear PVC with plasticizer to make it flexible. Using two highly polished surfaces and pressing two pieces of .020 with great pressure and heat forms the sheet we know as .040 pressed/polished that had been regarded as premium until the 90’s. The vinyl testing done for us, revealed that .040 pressed polished begins with a light transmittance of about 84%, haze of about 1.8% and yellow index of a -3.3. The negative yellow is attributed to the haze or "Blue." This blue is evident when you turn vinyl on its side and try to look through its edge. Vinyl is not a stable product in that it expands and contracts a great amount depending on temperature and pressure exerted on it. A walk through a marina on a cold night should reveal tight fitting enclosures. A trip back the next sunny/warm day may reveal wrinkles and sagging on the same enclosures. This produces distortion that cannot be overcome. A shop that does excellent work can minimize this but every change in temp and pressure creates different problems. After 5,000 hours of Xenon Test, results show the light transmittance has actually increased to just over 88%, however the haze has increased also to 18.8% and the yellow index has increased to 3.3. The haze at this point is more of a gray than blue. As a comparison acrylic at the same 5,000 hours transmitted 92.1% of light, haze was 4.8 and yellow index 0.5. If you are wondering about the light transmittance for vinyl, the yellow actually helped transmit more light. STRATAGLASS® introduced coated vinyl in 1993. The coating makes the vinyl more scratch resistant than even Acrylic. However once again, once scratched repairs cannot be made. Tests have shown that the coatings have not been able to stop the effect of haze from UV. We have been in the business for over 25 years and cannot distinguish coated from un-coated when simply looking at the two placed before us. A new coated vinyl to the market is O’Sea™ produced by O’Sullivan and looks very promising. Every aspect of O’Sea™ is produced in-house under strict tolerances. Co-Polyesters were a newcomer to the marine market as an answer to EZ2CY® back in the early 90s and was short-lived, co-polyesters are most commonly used to make plastic soda bottles. Semi rigid sheets are made from a raw pellet form of Copolymer produced by Eastman® Chemical under the name SPECTAR® which is a glycol-modified form PET (PETG). Trademarked Brand Name Sheets Include but are not Limited to: VIVAK®, Ultros®, Rexstar® HG, Prime® PETG 5700 and TOUGH STUFF®. Very rapid breakdown of un-protected product due to the sun dictates that only the UV resistant form should be used outdoors. Information supplied by VIVAK® shows that it starts life with a light transmittance of 86%. A Haze of 1.0 makes it better than the previous two materials but still not approaching the near absence of haze found in Acrylic of 0.2. Tensile strength is less than any of the above semi-rigids. An important factor that should be considered when utilizing co-polyester is the relatively low heat resistance of 140ºF. A four-sided bridge can easily reach this temp! Each of the materials listed has its place as stated earlier. Some owners don't care, some want only the best, some want the best only if they can get it for less money, some boats make a rigid enclosure just not practical, some only need the enclosure for limited times, others may want to air-condition the bridge. There are the 80' yachts where customers are shocked at the price and end up with .020 roll goods. We believe that most high-end customers know if you are well informed or not and it pays to just be honest. Weigh each issue one at a time, then as a whole and determine what you feel is right for you. We feel acrylic performs very well and have not yet found another material that would serve our customers or us as proficiently. We have seen charter boats that the Acrylic still looks and functions very well even after ten years. However we are constantly looking, testing and scrutinizing all materials available and commissioning new materials to see which we should employ making cool2sea™ and clear2seauv™ the most advanced enclosures available. The weakest link: When fabricating a high-end enclosure, there is a need to make sure all of the components are high-end. A Viking Yacht owner would never accept zinc-plated cleats on his yacht and he should not have to accept auto carpet binding or cotton thread on his enclosure. As one moves to a better glass, a parallel move should be made to the best components. Use of Steadfast2™, SolarFix® thread and YKK® zippers creates a total premium product. Boat owners that understand quality appreciate the details. Equally important is the execution and fabrication of said components. The enclosure needs to fit the vessel and the owner. Improper installation of even the finest enclosure can lead to premature failure and excessive leaking. Track to track installation done to distribute stress and minimize gaps that water may enter will also extend the life of the enclosure. The answer for most boats is likely a combination of clear materials. An important factor in this equation is how long the product is going to deliver quality and performance that is acceptable to you and meets your high standards? The weight of this factor can only be determined by you! You also need to be comfortable with your fabricator and consider if he/she will be able to help you in all areas you boat. There is a value/re-sale value attained from utilizing a name and company that is associated with a larger group able to service your enclosure in many different locations. We sincerely hope any misconceptions have been clarified and that this information enables you to make a more informed decision. If you have a question, believe any information is incorrect or would like to comment; please talk to us. Send an email to jeff@4u2sea.com or call Jeff directly at 410-507-1122.